The controversial coal train issue is coming before the Board of Lane County Commissioners tomorrow (10/3), according to an agenda item buried under “County Administration.” Though the issue has been in the news and is a source of debate among Lane County and Eugene residents, it appears no effort was made by the county to publicize the vote. The upcoming 10/8 Eugene City Council vote on the issue has been a source of controversy and of news stories in the R-G and EW for months. The county’s vote will take place tomorrow at the Public Service Building, 125 East 8th Avenue, and public comments can be made at the beginning of the meeting, which starts at 9 am. Commissioners can also be contacted via phone or email through the county’s website. Click the image to view the agenda on the county’s website. Now, therefore, be it resolved that the Lane County Board recognizes the responsible development activities of the Port of Coos Bay related to increasing its ability to deliver, store, and transfer bulk commodities to the global marketplace. EW has contacted County Administrator Liane Richardson, Board Chair Sid Leiken, Intergovernmental Relations Manager Alex Cuyler, who is scheduled to bring up the issue, and the county public information officer for more information on the coal train vote and its scheduling. Coal dust contains heavy metals including arsenic, cadmium, benzene, mercury, and lead. Project developers say they would use a “surfactant,” a sticky spray on top of the rail cars, to limit coal dust. The Burlington Northern Santa Fe Railway conducted extensive testing on 1,633 coal trains and found that sealants sprayed on loaded coal cars dramatically reduced coal dust – in some cases to zero. Increased train traffic also means increased diesel exhaust. 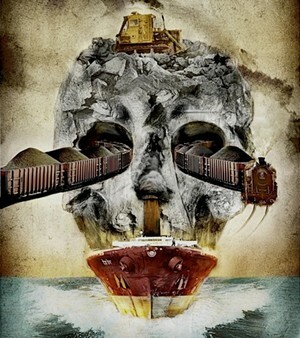 In Oregon, over 130 doctors have asked Governor Kitzhaber to order a comprehensive “health impact assessment.” Physicians opposing coal export are primarily concerned with the effect of diesel particulates on pulmonary and neurological functions. In Eugene, the Trainsong, River Road, Bethel, and Whiteaker neighborhoods are particularly vulnerable. Other health and safety concerns include noise pollution, increased railroad mortality, and obstruction of emergency vehicle access. In addition, the accumulation of coal dust could damage crops, contaminate water, pollute the air, and poison the wildlife. Coal dust also corrodes and undermines rail infrastructure, so coal trains have a high risk of derailment. Five coal trains derailed in the U.S. during the summer of 2012, one just outside the Columbia River Gorge in Washington. Beyond Toxics, Cascadia Wildlands and other local groups have weighed into to object to coal trains and will likly speak at tomorrow’s commissioners meeting. UPDATE: The county says the documents supporting the Coos Bay Terminal agenda item are now up on the website.